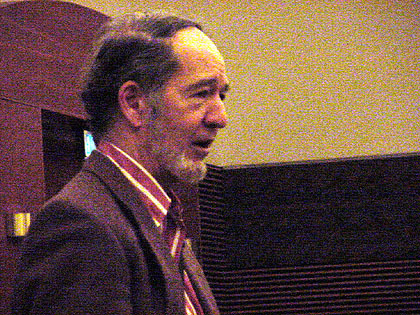 March 31, 2006 | Famed author and intellectual Jared Diamond said the problem of overpopulation will be solved either through pleasant ways of our choosing, or by unpleasant ways not of our choosing. Thursday night in the Kent Concert Hall, the leprechaun-like Diamond eschewed the podium during a brief talk before a packed house, pacing back and forth and speaking in casual, conversational tones. "The big question is why some civilizations are successful over time while others fail?" Diamond asked before offering several examples of societies that collapsed. Diamond said the Anasazi lived in small cities with six-story skyscrapers, the tallest structures in North America until the invention of the steel girder, off a corn-based agriculture in the modern Four Corners area, where no one farms corn today. In A.D. 1118 they stopped construction on their towers and abandoned them. A Norwegian colony on Greenland lasted for 450 years -- longer, Diamond said, than European civilization has been in North America -- before ultimately collapsing. "I chose the subject of collapse because it is the single most vital, engaging and fascinating subject I could think of," Diamond said. The best metaphor Diamond said he discovered for the planet Earth was the civilization of Easter Island, which is isolated in the Pacific Ocean much as Earth is isolated in the universe. The Easter Islanders depended on their subtropical forest to provide many resources, including wooden rollers and rope to erect their famous idols and dugout canoes to voyage forth into the ocean hunting for tuna and dolphin. When the last tree was cut and they were unable to hunt for sea-creatures, sometime around A.D. 1680, Diamond said, the island kingdom's people began slaughtering and devouring one another. They knocked down their mighty stone statues and vanished from history. "The best way I know of to offend an Easter Islander is to say, 'The flesh of your mother sticks between my teeth,'" Diamond said. A five-point checklist can determine whether a civilization is heading for collapse, according to Diamond. The first criteria he said he looks for is human-environmental impact, such as overexploitation of resources. Second is climate change. Diamond said that while the Earth is warming due to human activity at such a rate that by the year 2020 Glacier National Park in Montana will become glacier-less, the climate has changed for other reasons in the past and civilizations like the Anasazi were unable to cope. Third, Diamond said, is the presence of outside enemies who either destroy the civilization themselves or simply compound internal problems, causing collapse to take place. Fourth is the presence or lack of friendly allies, and finally Diamond said how a civilization responds to crisis is the fifth item on his checklist. "Environmental problems are very expensive to solve if you wait until they blow up, but they can be relatively cheap if you anticipate them and act before it is a catastrophe," Diamond said. This lesson, Diamond said, was "rubbed in our faces" during the recent calamity on the gulf coast. "In the case of New Orleans, we saved ourselves $300 million by not repairing the levies and cost ourselves $300 billion in the long haul." The much-decorated geography professor from UCLA concluded his appearance with a book signing in the foyer of the Concert Hall.